Love will certainly be in the air when you toast to your romance with this carry-on cocktail kit. 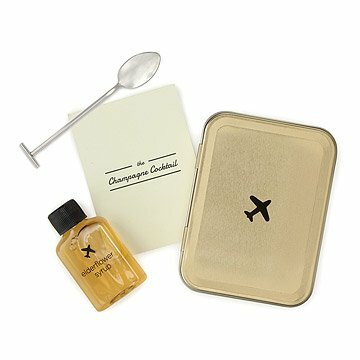 Love will certainly be in the air when you toast to your romance with this carry-on cocktail kit that's made for a couple of jetsetters. Celebrate in style and make the most of your flight's bar cart by whipping up a pair of champagne cocktails spiked with aromatic elderflower. The flight-themed tin adds a dash of first-class flair to your on-the-move mixology. A surefire way to enjoy your time in the air and with the person you love, this kit and a splash of bubbly will perk up your spirits as you zip off to some far-flung locale for your honeymoon or anniversary. Consumables sourced in the USA; kit developed and assembled in the USA. Want more in-flight options? Try our other Carry-On Cocktail Kits! Makes two Champagne cocktails. Alcohol not included. This item is manufactured in a facility that processes soy. Jetsetter/Trendsetter with the Champagne-Carry kit. Love the concept. I took everything out and examined it. And tried to smooth down the scratches, and I trimmed the loose threads, there were a lot. It's a perfect idea for that magical moment in the air. I would tidy it up a little more, as to not take away from its charm! I'm very happy with this . I gave this as a gift. The newlyweds loved it. Sent this as a gift for two friends having a baby to use on their next flight to see their surrogate! My best friend used this on the way to Florida for a destination cruise wedding. She laughed at its novelty but enjoyed the champagne on the way. perfect size for flights as its smaller than a bottle of shampoo. Got this for my friends honwymoon, it's so cute!! Creative idea and cute gift for a couple traveling together on their way to new adventures.